2012 was the year that online reviews became a “thing” for businesses. 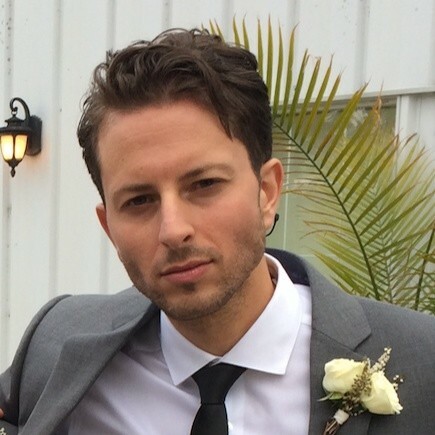 It was the year that all the review platforms started stepping in the ring. 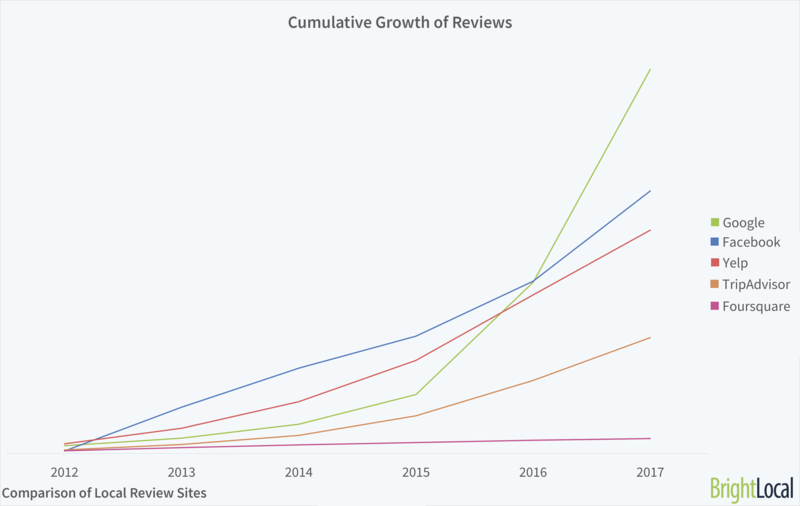 The first result that stuck out to me while looking at this chart is Google is the only platform to show exponential growth in local business reviews. Facebook is far behind. And reviews play a much more important role in purchase decisions today then they ever have. The reason for that? It’s quite simple. Reviews these days are more trusted than branded messaging. People care to share their experiences and others see reviews as their own trusted digital advisors. Google reviews are highly influential for guiding perceptions about a company or organization, and is used as the modernized business directory. Remember those huge Yellow Pages directories that were dumped on your doorstep year after year? Well, the internet has pretty much killed off The Yellow Pages. So why the sudden increase? Google is, without a doubt, the most visible review platform online. So many consumers are using Google to find, locate, and get more information about local businesses. According to Bright Local, 54% of people search for a local business online at least once per month. So it makes sense that they turn to Google as their trusted source of online reviews. Now that’s not to say that business owners should *only* focus on Google reviews and not Facebook, and other sites. It’s always wise to diversify, but you should be aware of the platforms that have the most eyes at all times. Here is a graph that shows the growth of Google reviews submitted to businesses. The sheer difference from Q1 2016 to Q2 2017 is tremendous. Since 2012, it is absolutely staggering the increase in online local reviews, especially Google reviews. The new age of digital consumers have learned to trust search engines like Google, and if your company is resting at the top of a list of Google's search, what better validation is there than that? Google reviews have much more impact in search rankings than Yelp or other local search sites. Quality and quantity of reviews are the most important factors that affect the Google ranking. This comes from a lengthy study done by Digital Marketing Works. 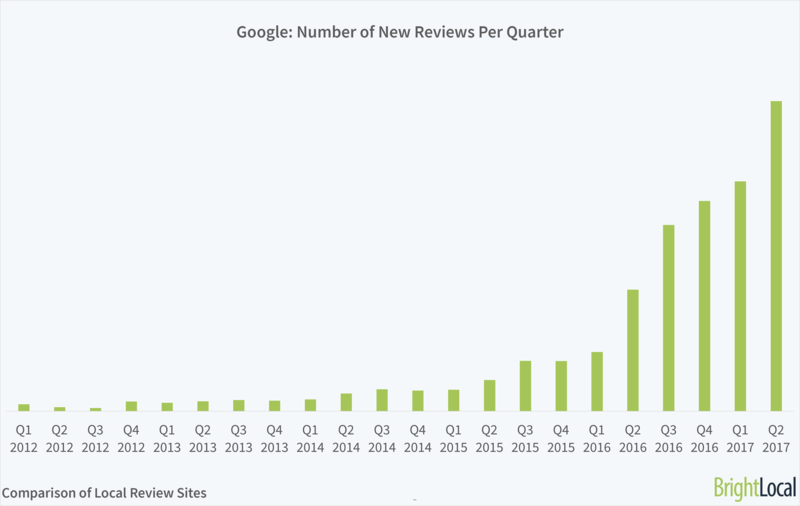 It has also been shown that lengthy reviews have a greater impact on Google ranking than short reviews. That’s why its advantageous to make it as easy as possible for someone to leave that review! Google reviews, and platforms such as Facebook is not something to ignore. Instead of spending crazy amounts of money on traditional advertising, let your customers do the advertising for you. Let them tell others about what a great experience they had at your business. Hopefully these findings will inspire you to focus on your review generation, and re-inforce this in your own business!